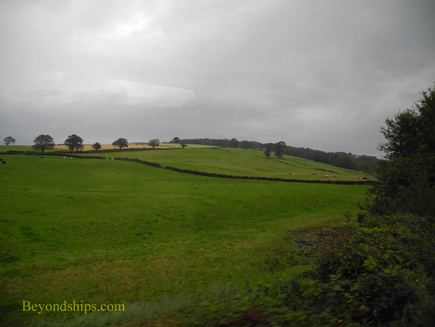 Above: The countryside between Glasgow and Stirling consists of lush green fields interspersed with stands of trees. Below: A view from the castle's battlements. Just visible through the distant haze is a monument to William Wallace. Above: The Forework was built by King James IV as a processional entrance into the castle. It was built more for show than as a military defense as it would not have been able to withstand contemporary artillery. Below: King James V's Palace overlooks a small garden known as Queen Anne's Garden inside the castle's defensive perimeter. A larger formal garden known as the King's Knot lay in the valley below the castle. 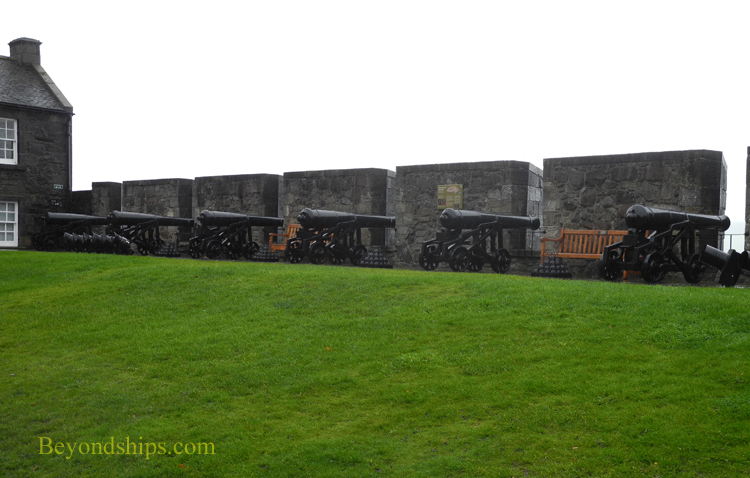 Above: While some parts of the castle's defenses such as the French Spur date to Mary of Guie's time, most of the outer defenses are 18th century and were added because of Jacobite Risings. Below: The King's Old Building. Above: The Chapel Royal of King James VI. Below: Inside the Chapel Royal. How do you make a centuries old monument come to life? The usual path is to do a bit of patching and repair and let visitors walk the grounds and the monument's empty halls. One might add some graphic panels or a few displays and in hope that their imagines will be inspired to fill in the blanks. 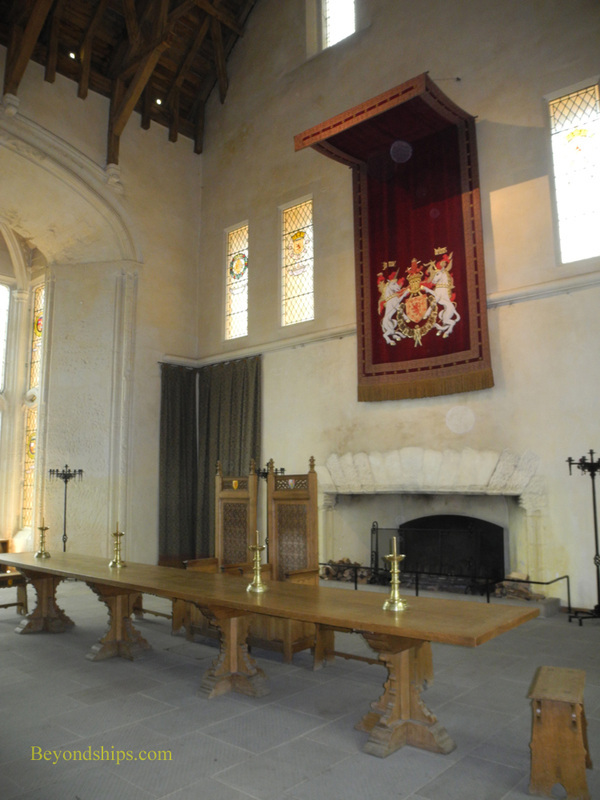 However, at Stirling Castle, they have taken a much more ambitious approach to the delight of more than 300,000 visitors each year. 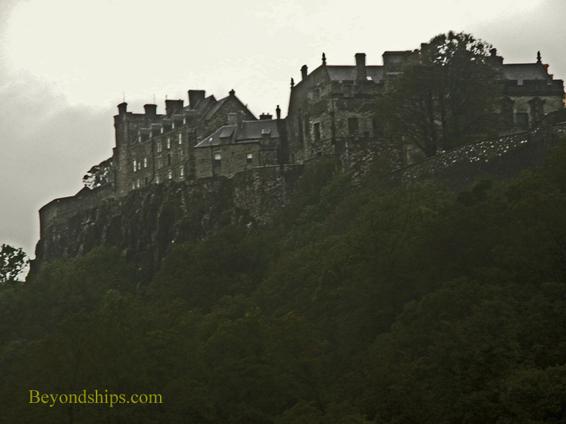 The origins of Stirling Castle are obscured by the mists of time. 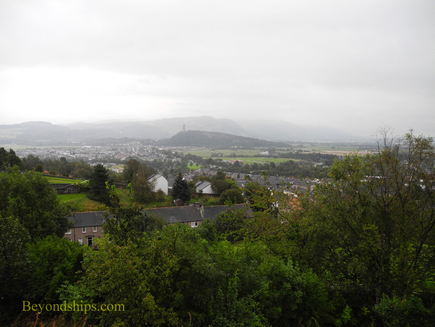 Some say that the rocky crag overlooking the city of Stirling has been inhabited since Prehistoric times. Others claim that the Romans fortified it. It has even been associated with the legendary court of King Arthur. However, the first record of the castle is from 1110 when King Alexander I dedicated a chapel there. 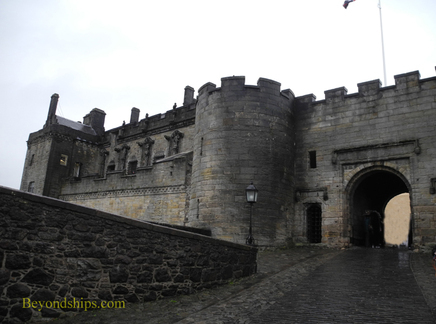 Stirling Castle is in a strategic location overlooking a crossing of the River Forth. As a result, quite a few important battles were fought nearby. For example, within sight of the castle, William Wallace defeated the English at the Battle of Stirling Bridge and Robert the Bruce did the same at the Battle of Bannockburn during the 60 year long Scottish Wars of Independence in the 14th century. The castle was beseiged and changed hands several times during that struggle. 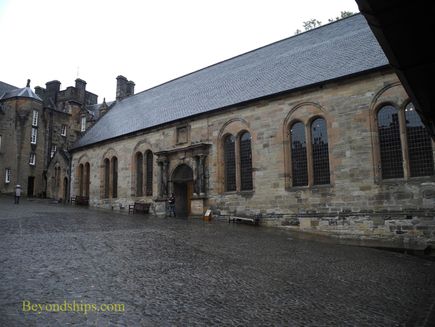 Nearly all of the buildings that you see at Stirling Castle today date from the Renaissance. Stirling had become a royal residence and by the time of King James IV, a full Renaissance court was flourishing at Stirling. James wanted to bring his residence in line with other European courts and so made a number of improvements to the castle. This ambition was shared by his son James V who made even more changes to the castle. After James' death following the Battle of Solway Moss, his infant daughter Mary Queen of Scots was crowned at Stirling and lived there until as an adolescent she went to France and married the heir to the French throne. 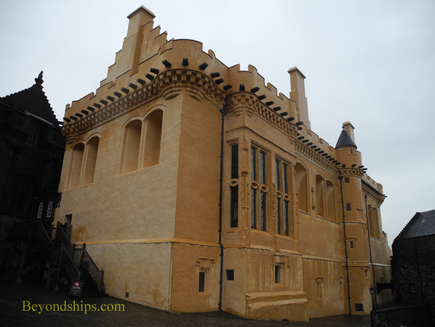 Her son, King James VI, was the last reigning monarch to make major changes to the castle. However, after the union of the Scottish and English thrones, James, now also James I, lost interest in Stirling. During the Civil War, his grandson, Charles II lived at the castle for a time. But he was was the last reigning monarch to do so until Queen Victoria came to visit in the 19th century. Still, the castle continued to have military significance. It was successfully besieged by the English Parliamentary forces under General Monck in 1651. During the Jacobite Rising of 1745, Bonnie Prince Charlie made an unsuccessful attempt to take the castle. In the years that followed, Stirling became first a prison and later a military base. In the 1890s, it became the headquarters of the Argyll and Sutherland Highlanders. 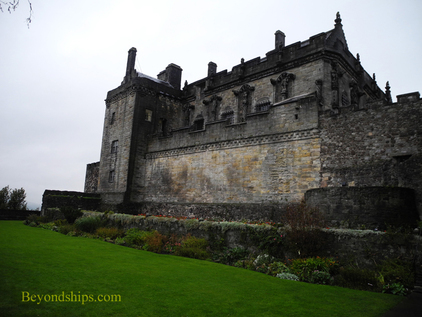 Stirling Castle is about 25 miles from Glasgow, a 30 minute drive through the countryside. Unlike the wild bare terrain of the Scottish Highlands, the area surrounding Stirling is a lush area of rolling hills and fields punctuated with stands of tall trees. It seems more like Ireland than the stereotypical image of the Scottish countryside. The castle itself sits majestically atop its crag, dominating the skyline. While history teaches that it is an illusion, the castle just looks impregnable with its nearly vertical cliffs. In any case, it is indisputably impressive to behold. The view is equally magnificent from the battlements of the castle. Hills and valleys stretch out for miles. In the distance, you can see the Memorial to William Wallace (a.k.a. “Braveheart”). 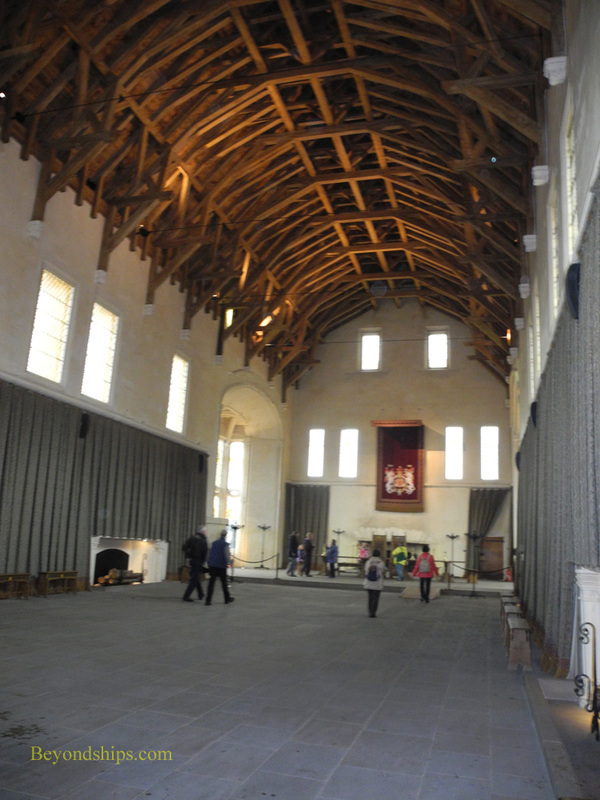 Stirling Castle's major attractions are situated around the Inner Close. On the western side of this quadrangle is the King's Old Building built in the 1490s as a residence for King James IV. It is now the regimental museum of the Argyll and Sutherland Highlanders and contains artifacts and displays documenting the regiment's history, which included action in the Boer War, the First World War and World War II. To the north is the Chapel Royal. It was built in 1501 by King James VI in order to have a suitably grand place for the baptism of his eldest son and heir Prince Henry. The chapel was completed within a year in time for the ceremony. However, Henry died when he was 18, never becoming king. 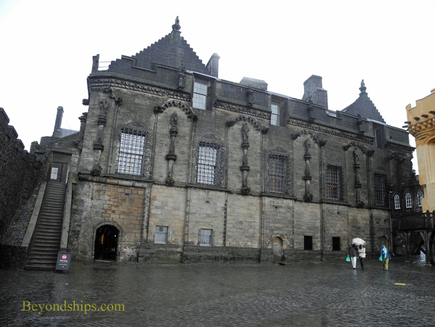 On the east side of the Close is the Great Hall, built by James IV in 1497 as the largest banqueting hall in Scotland. It was here that Mary Queen of Scots held a lavish celebration after the baptism of her only child, the future James VI. James likewise held a celebration here after the aforementioned baptism of Prince Henry. The most impressive feature of the Great Hall is its hammerbeam ceiling. The original was removed during the period that the castle was a military base. What we see now is a recreation that took some 35 years to complete and which is modeled after the Great Hall in Edinburgh Castle. Finally, on the south side of the Close is the Royal Palace. 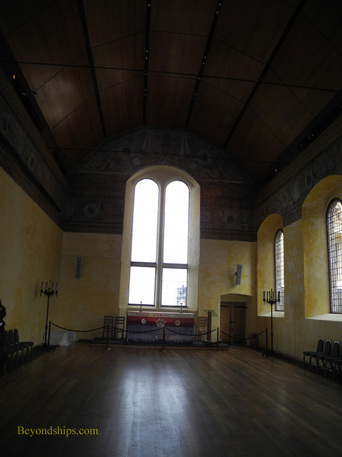 Above: Inside the Great Hall.